Glacier National Park Art - Come Meet the Artist's! Artists Reception, East Glacier Park, MT Come meet the artist's . . . Saturday August 20th from 6 to 8pm! - with special guest singer Emma Hagan! We invite you mingle with friends and the artists on July 16, 2011 at the Glacier Impressions Gallery in East Glacier Park, MT - 1000 Highway 49, next to the big purple spoon. Make sure when you come over to also stop by the John L. Clarke Gallery, and the Spiral Spoon both right next door. The reception will begin with light snacks and some beverages at 6pm and wrap up around 8pm. Please stop and say hi and take a look around. We have some exiting new pieces that we'd love to share with you! The season is off to a great start! We just finished our first "art-walk" of the year. Turn out was great, se saw lots of smiling faces! Now we're planning our next event, our first of the year art show on July 16, 2011. Please join us for a afternoon and evening of great art, fine company and light snacks! All of our art is created local artist inspired by a lifestyle of living the presence of the Backbone of the World, Glacier National Park. We are group of dedicated year long established artist from the East Glacier Park area. We make Glacier Park our home and are proud to share with you some of the very Glacier Park are available anywhere. Please come by and visit us. We are located at 1000 highway 49 about one mile from the Glacier Park Lodge in between the Purple Spoon and the John L. Clarke Gallery in East Glacier, Montana. We have the best photographs (Tony Bynum and Kerry Nickou), oil paintings (Roger Rink), watercolors (Gina Rink) and jewelry (Mara Hagar, Leonda Fast Buffalo Horse) and just received some great new glass work and quill work crafted by Leonda Fast Buffalo Horse. Please come join us! If you cant make it, please give us a call at: 406-450-8187! Spring is officially here but it's still snowing. The Park Service is plowing roads but nothing is open quite yet . . .
Glacier Impressions Gallery Plans to open Memorial Day Weekend. . . Here's a short video of what things look like here and at the Gallery. I'd also like to take this opportunity to show you another video of a large print on canvas I completed recently. Enjoy and we look forward to seeing you a couple months! The Buzz is in the Air! The wheels are gripping. . . we're gearing up for a great season with some new work and lost of great talent for 2011. While the snow is deep, in fact I think it's about 6-8 feet deep in front of the gallery, we are working on new material for 2011. We will open the doors Memorial Day weekend and plan for some terrific events this summer. We are located on Hwy 49, in East Glacier Park, MT, just a mile down the road from the Lodge, under the train overpass. If you have any questions or would like to talk to us about what's in the gallery, we are available any time. Thanks for checking in, well see you in a couple months! Thanks for the Great Summer Season! Thank all of you for the great season! We had a wonderful first year in our new location. We now are closed for the winter but plan to open again early next June or late May 2011. If you would like to talk to us about the gallery please contact Tony, Bob, or Gina. 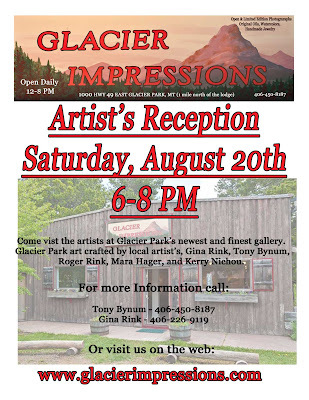 Glacier Impressions is gearing up for it's final art show, and artists reception of the summer season. Saturday, September 4th starting at noon will be live glass blowing, a rock and mineral expo and live music. The artists reception will be from 6-8 pm showing art from Montana nature and wildlife photographer Tony Bynum (new fall additions), water colors by Gina Rink, oils by Roger Ring, blown glass by Dave Rummel, and jewelry by Mara Haggar. 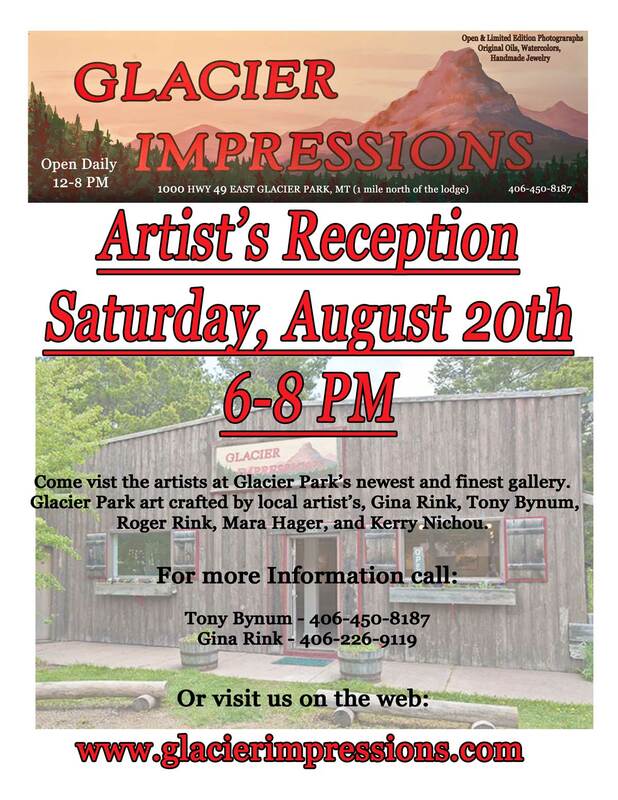 All art in Glacier Impressions is made by local East Glacier Artists. Please come and share in the activities and while you're here visit the John Clarke Gallery, the Spiral Spoon and the Blackfeet Art Gallery in Browning.